I look at the ICT statistics reported anually by ONEI, the Cuban Office of statistics and information, every year. This year's report has been out for a while, but I have been too focused on the impact of the Internet on the US election and its aftermath to look at it until now. The first thing that jumps out is a 28% increase in the number of number of users of Internet services, while the number of computers connected to the net is up by only 2.3%. That means either many more people are sharing computers or they are reporting apples and oranges. While I am sure many people use shared land-line computers to access the net at work or school, the count of users of Internet services must include users who bring their own portable devices to public-access WiFi hotspots. Furthermore, they combine the number of users with international Internet access and those whose access is restricted to the domestic Cuban intranet. Users at public-access locations can reach most, but not all, of the Internet since the Cuban government and some US companies block some sites and services. 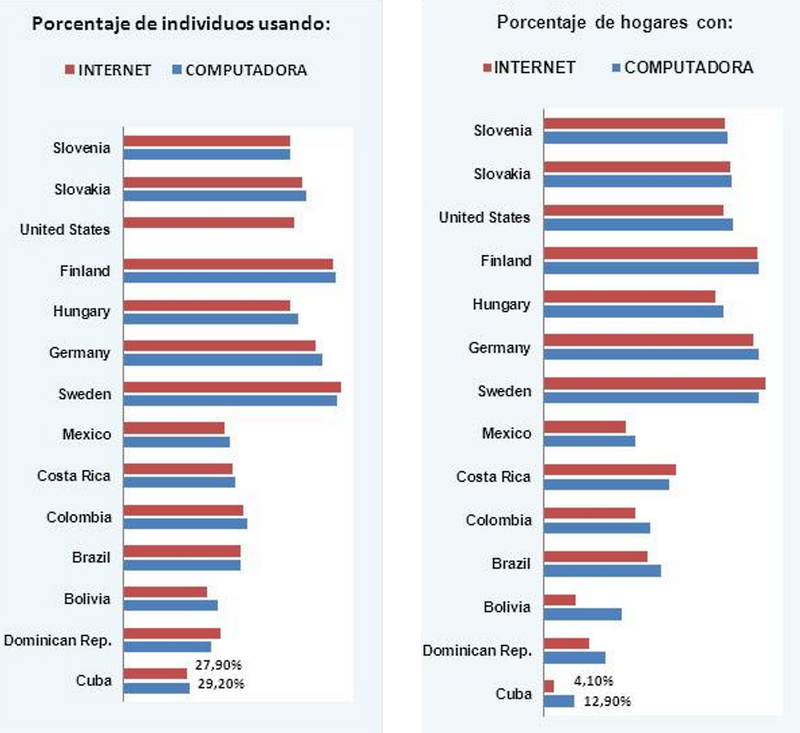 I frequently see it stated that 5% of Cubans have international Internet access, but have never seen any data to support that arbitrary number. Finally, we must remember that the experience of a Cuban Internet or intranet user is not the same as that in most other nations -- connections are slow and unreliable and the cost is extremely high. We also note that the number of .cu domains has remained essentially flat for two years, probably an indication that most new Cuban Internet sites and services are being registered as .com, .es, etc. I suspect that most new .cu registrations are by government agencies or enterprises, but have no data to support that. I also wonder if some change in Cuban law caused the .cu registration to drop precipitously in 2014. The report also covers telephone service. Only one new central office was added this year, bringing the total to 741 (689 digital). That is relevant to the Internet because a plan that was leaked in 2015 said that by 2020, Internet connectivity using DSL technology would be available to 50% of Cuban homes. (Note that they say connectivity would be available, but do not project prices or say that 50% of homes would subscribe). For that to occur, the equipment in central offices must be upgraded and/or phone wires running to many homes replaced. This report says nothing about either and we can not be sure that the plan is being executed. Regardless, if it is carried out, the DSL speeds will be slow. DSL is a poor technology choice, especially in a nation with old telephone wiring. Cuba should look at other options for home connectivity, and there is an indication that they are doing so in a fiber trial that is expected to begin in Havana this month. (A friend told me it would start on December 5 -- stay tuned). Professor Armando Camacho has posted his analysis of the latest ONEI ICT statistics report (in Spanish). He comments critically on the report and also discusses Cuban ICT statistics in context by comparing them to those of other nations. He has followed up with an online survey of Cuban Internet users, which you are invited to complete.